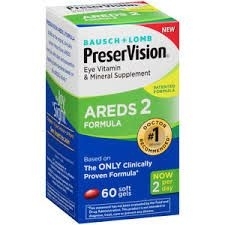 Bausch & Lomb PreserVision Eye Vitamin AREDS 2 formula builds on the original PreserVision Eye Vitamin AREDS formula, replacing beta-carotene with lutein (10mg) and zeaxanthin (2mg), and adding Omega-3 (1000mg) per daily dosage. Bausch & Lomb original PreserVision Eye Vitamin AREDS formula is the one and only antioxidant vitamin and mineral supplement formula proven clinically effective in the Age-Related Eye Disease Study (AREDS). Adults - Take 4 Softgels per day: 2 in the morning and 2 in the evening with meals or as directed by your physician.